The halo braid is a more casual type of braided hairstyle. I think it’s a great look by straddling the loose vs. pulled back style. It’s a good balance and works in more formal settings as well as for everyday wear. We feature a stunning gallery of women with various types of halo braid examples so that you can see the different ways this braided hairstyle is worn. A gorgeous half-up is a combination of several types of braids that provides different types of texture. This one has crown braid, fishtail, twisted three-strand and rope braid altogether. One thing about braids: it does not need a specific style. It works on both ways whether you like it neat or messy. In this braided halo, a messy style is chosen and it actually looks perfect with all the contrasting elements and texture. Long and straight blonde hair, tightly secured in a neat and polished halo braid. Set it with some hairspray and you're good to go. Traditional dutch halo braid for blondes, enhanced with colorful floral embellishments. Blonde, crimped hair styled into a halo braid, accented to one side. The hair is nicely textured but still looks neat. For a simple everyday look, this halo braid is easy to achieve and maintain. Looks really nice and clean on casual outfits too. Achieve that perfect Boho look with this slightly messy crown braid. This one uses two sets of braid for that highly-dynamic finish. A bridal upstyle with two braided headbands and elegant floral details. This one has a quite polished finish, a combination of sophistication and style. Brunette wearing a crown braid with romantic flyaways. The highlights, although subtle, give a beautiful effect to this hairdo. Natural hair with a touch of pink highlights, styled into a polished halo braid. This upstyle looks simple yet creative and fun! A neat dutch braid arranged into a beautiful hair crown. This one's a perfect upstyle for bridesmaids. Slay like a queen with this fully-arranged halo braid. The french braid is neatly-done and the overall look is simply stunning! Long, straight and highlighted dark hair in a chunky halo braid. 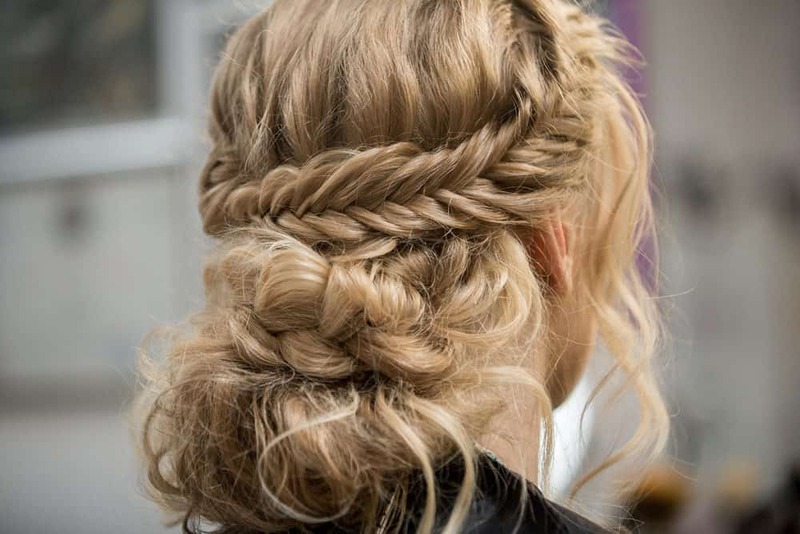 The highlights, although quite minimal, emphasize the beautiful movement of the braid. Naturally curly hair, arranged into a beautiful crown braid for a neat and sassy look. This halo style, oversized fishtail braid is precious! Elegant hair clips make it more formal and sophisticated. Why settle with one halo braid if you could have two? This double crown style is great for wedding ceremonies, decorate it with floral embellishments and you're good to go. Long, blonde hair with peach highlights styled into a messy halo braid. This one is done without the pins, simple hair tricks and tucking is the key. Slightly tousled fishtail braid arranged into a halo style. This hairdo gives brunettes that touch of Bohemian vibe. This gorgeously done halo braid for long, straight hairis loose enough to create a nice depth and volume. A beautiful milkmaid braid that used as a crown decoration. This style looks way better if you have two-toned hair. In June 2016 this braid style reached enormous popularity as indicated by the trend chart below. Since then, it’s declined in popularity but it’s still a braid style staple.